Have a 50-60Hz hum/buzz in your system ? Its likely a ground loop issue and luckily there are ways to combat the issue. Feel free to make this a sticky as the issue is common and not just related to subwoofers. Ground loop noise (50-60Hz hum) is a common occurrence when multiple devices are connected to a ground through different paths. To prevent ground loop noise components should share one ground or be isolated using a isolation transformer. Excellent ideal Jason to make this a permanent thread. I will post some start info. If you like it I can leave it Jason and if you don't, I can delete it. It's something to help the conversations start flowing for the thread. You've just connected your system and there's a buzz or hum that won't go away. You're running your gear through power conditioners and you're beating your head against the wall trying to figure out what's up. Congratulations - you've just entered The Ground Loop Zone..
Several weeks ago I was pulling my hair out after I installed a new component into Reference System 3 for review. It was an amplifier that came with a three-prong power cable. Immediately after placing the amp in my system a very noticeable 60Hz hum starting pouring from my speakers. If this has happened to you the chances are it's a ground loop between your Cable TV and another component in your system (like an amplifier or powered subwoofer). Now, how do you solve it? First it helps to define exactly what a ground loop is and how it may affect our home theater system. Remove one of the ground paths, thus converting the system to a single point ground. Isolate one of the ground paths with an isolation transformer, common mode choke, optical coupler, balanced circuitry, or frequency selective grounding. The most practical and usually most cost effective method for consumer audio applications is to use an isolation transformer. An isolation transformer is a device which, in the case of cable signals, allows all the desired signals to pass freely, while interrupting ground continuity, hence breaking ground loops. By using an isolation transformer, the ground noise voltage will now appear between the transformer windings and not circuit input. The noise coupling is primarily a function of parasitic capacitance between the transformer windings and can be reduced by placing a shield between the windings. This is an effective method to implement assuming the transformer has sufficient bandwidth, isn't too costly or bulky, and a direct DC signal path is not required for the application. To accurately determine the correct solution to a problem you first have to find and isolate it. For example, if you simply start flailing away, swapping gear and cables and everything all at once, you may never know what actually caused (or fixed) the problem. In addition, you may end up making more and more work since you are expending energy in areas that don't have any effect on the problem at hand. Start simple. Troubleshooting ground loops involves taking things in order and checking a few basic, common elements to see if the problem is simple, or complex. For example, if adjusting the volume on your processor/receiver does not alter the hum level, then the problem must be occurring after that point. It if occurred prior, then the receiver/processor would typically raise the overall level of noise. Make sense? Note any recent changes to the system that brought on this problem. Chances are, you can more easily isolate a problem if it just starting with the addition of a new piece of equipment. The final test is to unplug your Cable TV cable from the wall. Does the hum go away? It did in the case of Reference System 3. Eureka ! There must be a ground loop in the system involving the Cable TV line. While this article addresses a very common ground loop problem, realize that there are plenty of ways in which system buzz and hum can enter into your home theater setup. Common Problem #1: Check to see if you have a heavy power cord or an outlet in the wall that is worn out and will not grip. If the hot/neutral/ground prongs on the plug the ground are making intermittent or light contact with the tang on the inside of the outlet, it can cause a hum through the system. The best solution for this is to replace the outlet with an industrial version, available at Home Depot for about $4. The industrial outlets have better gripping and will hold power cables more securely. If you are installing a front projection system ceiling mount this outlet is a must. Common Problem #3: Light dimmers, flourescent lamps, and other appliances that share the same circuit or common ground with your home theater equipment can cause hums. There are at least two practical ways to fix the problem of a ground loop in your system. Once you know the problem is related to the Cable TV ground and the amplifier ground, as it is in this case (and lots of cases) you can lift the Earth ground on either device at the line level. I find it much easier to lift the ground on the Cable TV line than on 5.1 multi-channel inputs going into the amplifier! NEVER use a three prong to two prong AC adapter to fix a ground loop problem. These devices are meant to provide a safety ground (via the cover plate screw to a grounded outlet) in the event a three prong plug is used with a two prong outlet. It is always best to lift the ground safely at line levels. One can try to use a ground lift in situations where two grounded pieces of equipments with unbalanced connections experience ground loop related humming problems. Ground lifting in unbalanced connections works effectively only when both pieces of equipment are properly grounded to same point. In some cases the humming problem may become worse if a ground lift is used. Thus, this so called "fix" should be employed with extreme caution and usually only as a temporary solution. If the related equipment is properly grounded, simply lifting signal ground between equipment, may cause enormous amounts of humming and potentially damage the input amplifier of the receiving equipment because of the flowing stray currents on the ungrounded equipment. A better method of employing ground lift is to modify the cable to include an AC path between grounds, or a small capacitor. This will reduce the possibility of the ground lifted cable to pick up RF interference, but can also cause frequency response variations depending on capacitor size and equipment source impedance. Because of this, we feel the best solution for solving unbalanced connection ground loops is using audio line isolation transformer. The most common, and easiest, solution is to add a Cable TV ground isolator. Jensen Transformers has been around for over 30 years and makes one of the best (MSRP $59.95) as it has a flat frequency response from 2MHz - 1300 MHz, spanning the VHF/FM/UHF/CATV spectrum. Why is this important? Well for starters if you plan on using digital cable, a cable modem, or on-demand services you better not get a cheap RF filter from the local electronics store as it will most likely filter out more than you bargained for. 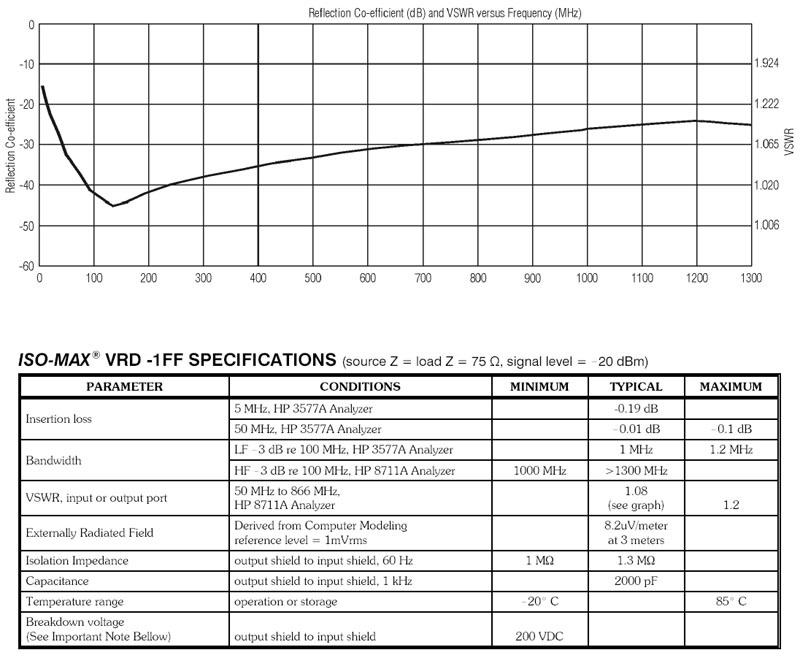 In addition, we respect a company who measures their products and is willing to post a frequency response performance graph to back up their claims. 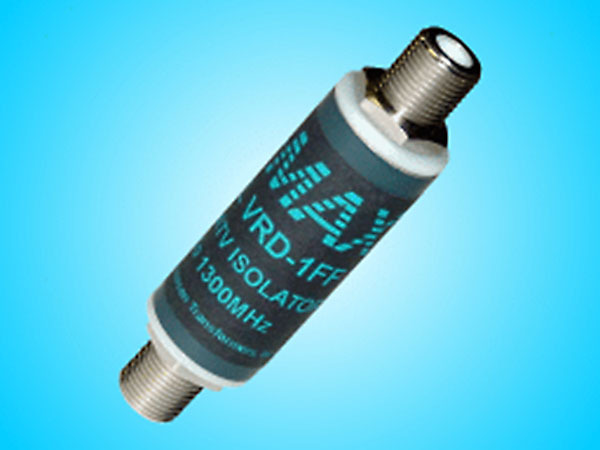 Getting a flat frequency response from 2MHz - 1300MHz ensures no loss of signal quality and a great result. One of the most widely popular methods of eliminating ground loops is to take a 75-ohm to 300-ohm converter, connected to a second matching transformer with two screw terminals on the 300 ohm side, and putting it inline with your cable TV feed. While this might break the ground loop, unless you merely subscribe to basic cable and don't give a hoot about signal quality we'd recommend avoiding this bit of McGuyver magic. In a word - yes. For around 80% of ground loop problems this is the cure. For those other problems there are other solutions, but we wanted to cover this often-encountered scenario and outline some quick and easy solutions to getting yourself out of the ground loop blues. If you have a ground loop caused by your cable TV run , don't walk, and pick up one of these beauties - you won't regret it. This is a nice article to help define the problem and a work thru flow sheet. Ground loops can also cause erratic operation of components, interruptions on your television screen and damage your equipment. Normally the longer the run the worse the problem but there are variables involved as well. Jensen Transformer website: http://www.jensen-transformers.com/ is an invaluable resource for understanding, troubleshooting and eliminating ground loops in audio and video systems. To look at their App. notes you have to create an account (big deal). Most of their app. notes are too big file size to cut and paste here. I have spoken with the President of the company several times and the cool thing is he only wants to sell you a transformer if you absolutely cannot fix your problem any other way. Also their app notes explain balanced and unbalanced interfaces and how to interconnect them properly. I've recently gotten my DIY Stereo Integrity DS4-18 up and running with a Behringer EP4000 amplifier. There is a ART CleanBox between my Pioneer receiver and my Sub Amplifier to boost the signal for the pro amp. I started out having a pretty bad hum, but it was substantially reduced after i connected the coaxial for my cable TV through my ARS surge protector/power strip. I've isolated the source of the remaining hum to the ART CleanBox which is powered by a two-prong wall wart. I concluded that the hum was originating from the CleanBox because the hum volume does not increase in volume when i turn up the receiver, but it does increase in volume when i turn up the gain on the CleanBox and on the Sub Amplifier. The hum also goes away when i turn off or unplug the CleanBox, but leave the amplifier turned on. Any thoughts on how i might be able to ground the CleanBox? I already have it plugged into the ARS surge protector with everything else. The Cleanbox II should eliminate hum not create it. As you've noted, it does not have a ground lug so I can't see how it would create a ground loop. When you turn the cleanbox off, you're stopping the signal from passing through. I highly doubt it's a cleanbox issue. started out having a pretty bad hum, but it was substantially reduced after i connected the coaxial for my cable TV through my ARS surge protector/power strip. This has nothing to do with your cleanbox but I'd wager the problem is originating here. First thing i would try is a ground wire leading from case to case, remove one by one to determine the culprit and go from there. Dummy plugs! Dummy plugs! See Jensen Transformer website mentioned above. There IS a scientific way to figure this out. If you disconnect your TV cable feed does the hum go away completely? If so you may need video isolator as opposed to anything in the audio path. Unfortunately lots of amp components can go bad and cause the same hum. Do balanced XLR inpus/outputs minimize/eliminate this issue? I know you can't toss your entire system in deference to a new one with balanced input/outputs, but if a person was putting a system together would balanced XLR connections be a worthy goal for all your components? Do balanced XLR inpus/outputs minimize/eliminate this issue?...if a person was putting a system together would balanced XLR connections be a worthy goal for all your components? Yes. There's a reason why the pro community uses balanced connections almost exclusively...and now the upper-end consumer community. I've had zero issues with line noise. One thing, however: you want to plug all your gear into one wall outlet--including your TV--in order to minimize ground loops. I have components plugged into six different outlet. I need to go back to no hum school, lol. "so far" I've not had any noise like this. I have the Crown's (two of them) plugged into separate circuits and all the closet stuff, plugged into a third. Now, if it matters, this is off a remote panel so ALL the circuits are fed by a single 50 amp breaker on my main box. Or, am I just lucky? For me, it is not even a question of running everything off one outlet or breaker. I can't with all the amps and other gear. I would be popping the breaker all the time. Just wanted to share for anybody who comes along. My upstairs theater had this problem whenever the INUKE amp was on, but not the AVR itself. As soon as the AVR was turned on, the hum went away and vice versa. Installing a ground loop isolator solved this problem 100%. I recently changed part of my downstairs theater and had the hum problem only with certain outlets. Well this time I used the same outlets but rearranged how it was all plugged in...and a hum won't go away now. So I installed one on this system and same thing, perfectly silent. XFinity's latest system uses coaxial cable that has a built in ground wire attached to it. I believe this is the problem. I installed one isolator right at the input of the cable boxes and problem solved. I purchased mine from Amazon, selecting one with 5 star ratings and lots of reviews. They were $19 each (FYI). Yes. I was once in ground loop hell for many years.. Switched my entire setup to xlr cables and the problem was instantly solved. I would not touch a unbalanced cable with a ten foot pole nowadays. Oh my God, a hum does not denote a musical sub, lol.